After a recent tragic accident in Alberta, Canada involving a junior hockey team, one young man’s death has saved the lives of six people due to his decision to donate his organs. The hockey player, Logan Boulet, registered to be an organ donor when he turned 21, just weeks before the accident. In Canada, each province has its own registry and process to become an organ donor, some of which have a process for parents to consent to organ donation for their children. In the United States, teenagers 15-17 can register when they receive their driver’s license, but parents are required to make the final decision until their child turns 18. There is currently no registration system to enable parents to register their children as organ donors. Our January 2018 Mott Poll asked parents of children 0-18 about their attitudes and concerns about registering their children to be organ donors. Almost half (49%) of parents of teens who are not registered organ donors would encourage their teen to do so. 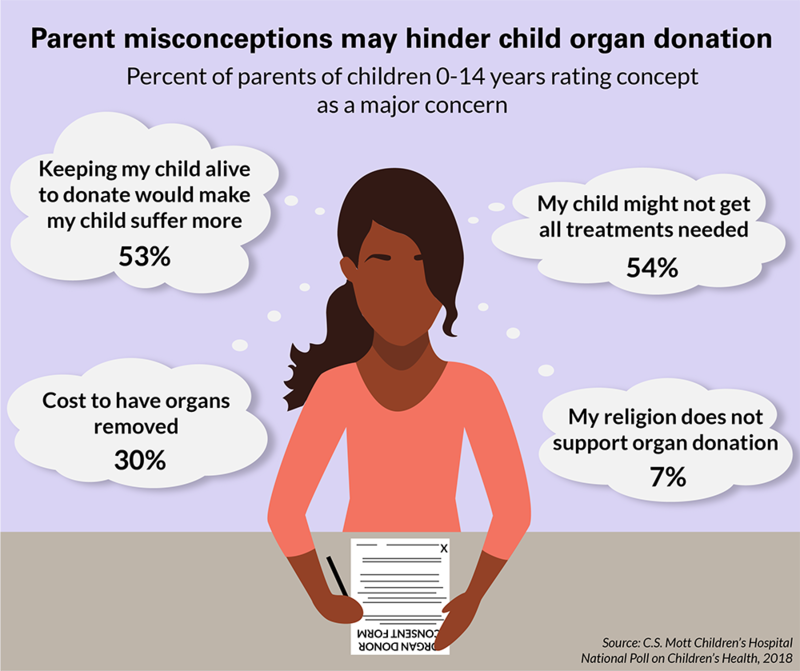 Misconceptions about medical care, potential suffering and cost are major parental concerns about organ donation. April is Donate Life Month. Over 100,000 people in the US are on an organ transplant waiting list. Among them, about 2,000 are children – 500 are between the ages of 1 and 5. In many cases, these transplanted organs must come from another child of similar age and size. While it may be difficult for parents to think about situations that may result in their child becoming an organ donor, most parents in the Mott Poll recognize that it would be an opportunity for their child to help save the lives of other children. To learn more about organ donation, or to register as an organ donor, visit www.donatelife.net. Are ride sharing services safe for teens?